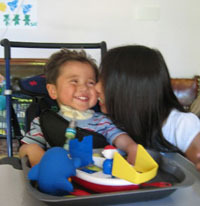 In July 2005 one-year Sam was injured in a near fatal car accident. After being in hospital for nine months and going through numerous serious operations, Sam finally went home. 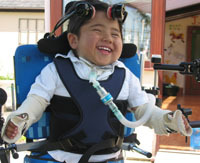 Sam is paralysed from the neck down and needs equipment to help him breathe. He also needs two full time carers at all times. He celebrated his fourth birthday in March 2008. 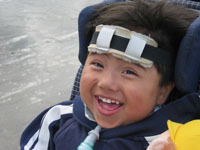 Every single penny raised via Stuff4Sam is used to buy equipment that Sam needs to help him develop. From Vicki at lifetime and PICU!!!! Thanks for coming by the blog! We have heard a lot about the fantastic work you have done with Sam at the Pediatric Intensive Care Unit and can’t thank you enough. Anyway, stay in touch and spread the word about the website – it’s great having people such as yourself pop up and say hello. It was so lovely to see you today- you have grown so big now and looked really great on your bike. I really like your trachy man and your fabulous tractor. Your Birthday is next week – have a lovely day – I am going to Nigeria soon and will try to write to you from there. Please give your Mum and Dad a big smile and kiss fom me. As you may have read we have managed through fundraising to buy Sam some much needed equipment that could not be bought by the NHS. This has included a FES exercise bike and arm extensions. The bike has been quite pivotal to building up his physical strength, muscles in his legs and his immunity. As you will know having a strong immune system is essential. It has also been crucial to keeping a wonderfully sparkley and beautiful little boy happy and entertained. I will forward your details to Neil and Kazumi (if they haven’t already seen your comment) as they will be able to explain more about what steps they have taken and why. Please do stay in touch with us either through the blog or via email, you’ll find us at stuff4sam@gmail.com. Howz yuz? I go to st marys school in Chippenham and mrs Stockting told us about you. Hope you are feeling better after reading this. A Relative of yours told me about you. i hope you are ok. my Friend shannon has already written to you and the relative of yours is our teacher Mrs stocktind (Cindy Stockting). I hope that you get better soon and my friend chloe has just been in a car crash and i hope she and her friends get better soon as well. I hope you get better soon and that everyone at st.Marys hope you get better soon as well LuLu and shannon are my friend of mine I hope you get better soon bye bye. you are also getting better. Hope you are well. We are off to Austalia and Singapore in 7 weeks so we will post a pic saying hello. Hope you are well and looking forward to starting ‘Big school’. Bradley is very excited. It was nice catching up with you at Lewis ‘s birthday party. Take care of yourself, love to mummy and daddy. May you and your family finally enjoy the peace you so richly deserve youg man. Sending my deepest sympathy to all of Sam, Neil and Kazumi’s family and friends at what must be a truly dark time. Peace be with you all. I never knew you and now you are gone, I just wanted to say what a beautiful boy you are and I hope you are running free in heaven with your Mummy and Daddy beside you. it’s obvious how much your devoted mummy and daddy loved you, I hope you all find the peace you deserve now. Three lights have gone out in this world but will hopefully shine on stronger in another. I have a tear in my eye.. very sad and upsetting news! Well young man, just shows how much mummy and daddy love you…..this shouldnt be recorded as suicide they just wanted to stay with him. Im a dad myself and cant imagine what you have been through…so all i have is respect for you all ….Rest in Peace!!! I pray dat u n ur mummy n daddy rest in peace. Very moving, very sad, very brave. I knew nothing of you until now. My deepest sympathy to those close to you all. My thoughts are with you. Such a terrible tragedy and a phenominally strong bond of love between one family. I hope that someday, someone takes on your website in your family’s memory and continues it’s good work to give strength to others in similar traumatic circumstances? Thoughts and prayers are with your family and friends, and may you all be at peace in heaven together. I hope that the three of you have found true peace, together for ever. What a handsome & charming boy! R.I.P. with your lovely parents…My love and condolences. What a lucky little boy to have such dedicated and loving parents. I live in Eastbourne and feel devestated by this, my heart goes out to the love they had for their little boy, who was beautiful. Makes me feel terrible when I have a bad time and shout at my kids, makes us all realize how lucky we are. My thoughts go out to you all. Sam your parents cared about you so much. Youve touched everybodys hearts which you checky smile and being a happy boy. Rest in peace. I also hope that someone close to the family does take this website on and raise money for others like Sam out there. Events will bring people closer and maybe help other parents who are in the same position as what Sams parents are. May you all RIP. Such a sad story. So sad to hear about this tragedy – it’s devastating. I only heard about Sam and his family today but I wish I’d known them. Sam looks to have been an adorable and happy little boy and I hope they are all running around together now at last and at peace. What a lucky boy to have been so loved. My thoughts and prayers go out to Sam’s extended family and all who knew and loved them all. Sam clearly brought much love and happiness to many people’s lives. His parents, family and unknown friends around the world did some wonderful things to make his short life a full one. I can’t imagine the agony his parents went through – it is surely every parent’s dread fear. I hope they found some peace at the end, but would urge anyone in anything like a similar situation to find someone to talk to. Life is so precious. God bless you all, such a truly sad story, I have tears running down my face. I have a 5 year old son and can completely understand that you must have felt utterly lost. Night night little man – mummy and daddy will keep looking after you in heaven. I am so sad to hear about Sam’s death and his parents’ soon afterwards. I am a mother of two and I can understand (albeit in a tiny way) the devastation they must have felt. I admire them hugely for the great 5 years they gave Sam and wish them all much peace and happiness now. Gutted. Walk on brave little soldier with M+D standing guard beside you… RIP all. Our dear William is five. You will always have a special place in our hearts. You have touched me so deeply. I am going to try even harder to be an even better dad as a tribute to your mum and dad. May God bless your family and keep you safe. I am so sorry to hear this tragic news. My heart breaks for you. I, like many others here today, never knew you Sam, or your devoted mom & dad. It takes a lot to make me cry for strangers. We should all learn from this sad event and realise how lucky we all are to have our health and families. Sam….Your mom and dad must have loved you so so much, there are three more angels in heaven and you will always all be together. Hi Sam! Hi Neil! Hi Kazumi! Your story defines perfectly what real love is, and I feel sad and inspired at the same time. What a gorgeous, strong and brave boy you are Sam, and given your parents, I can see where you get it! Rest and Play in Peace. Hi Sam….I am really sorry to hear what has happened, but I am really sure I will meet all of you in heaven…. We are praying for your eternal rest. May God bring all the strength to understand and learn from this tragedy. 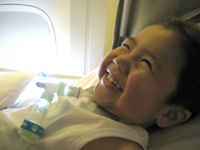 Sam was an angel, and his parents were very devoted. Es precisamente en estos momentos que uno logra darse cuenta que el amor y el dolor son infinitos y van de la mano, porque el amor tan grande que los unia y el dolor tan inmenso que significo para sus padres el perder a su hijo, los llevo a tomar esa determinacion para no dejarlo solo nunca, es que no siquiera la muerte la muerte les impidira estar juntos………Dios permita que esa decision sea tomada ante los ojos de Dios como un acto de misericordia y puedan estar juntos los tres y empezar una nueva etapa llena de paz, tranquilidad y felicidad. Que Dios les Bendiga y que descansen en paz……. How can any person even begin to try to understand the pain that such an untimely death as that of Sam’s must have brought his parents to bring such a tragic end. God bless you all and may you find true everlasting peace. Kazumi-san, I really wish I could meet you before. I am also a full time Carer for over 8 years. I am/was looking for some Japanese people who are like me being married to a British man and a Carer in the UK. I was moved by the sad news. I sympathize with you from the bottom of my heart. It comforts me to think that the members of this family were so loving and devoted to each other. I hope all of us can experience such a powerful thing! What great love for each other. May you rest together in the hands of God. I am grandmother to a dissabled 5 year old boy and cannot begin to imagine the pain of those left behind I hope you find more strenght than I could find. God bless you and I can only hope the image of sam running and playing with his mum and dad brings you comfort. Quede impactada por esta triste noticia, pedire a Dios para que tenga junta a esta familia en su santa gloria. My deepest condolences to Neil, Kazumi and Sam’s family and friends. May God be with all of you! sam, i just heard of your story today and it’s so sad that i’m crying today at work for you and your family. i love your smiling face and am glad you’re finally able to run and play! Rest easy little one, and know that you are loved. Your parents loved you so much, and now you are all together in heaven. i am sending you all my love. Tomorrow i shall plant sunflowers for you. I hope that your family is strong, and take strength from the life you all had. These pictures break my heart – RIP Sam and your Mum & Dad. Trajic news…trajic loss…RIP…you have moved a part of me that i rarely visit…thank you and god bless. I don’t know how it felt for you parents to loose Sam, but I do know how much fear and anguish you feel when you’re in danger of losing your child. If only all families were lucky enough to feel such an obvious strong love and such a bond and devotion to each other. You are all three so brave. I hope you have found peace with each other. My love and thoughts stay with you, although I never met you. My heart goes out to you and the loved ones you left behind. Really don’t know what to say….Looking at the pictures of Sam, you can totally understand why his parents loved him so!…… The devastation they felt must have been unbearable…..My thoughts go to all of their extended family and friends. Kazumi, Neil, estamos con ustedes en ese vuelo inmortal que ahora los lleva junto con Sam. Que la profunda pena que nos ha causado su partida nos lleve a pensar en lo verdaderamente importante de nuestras vidas y la bendición que significa tenerlo. No se han ido, solo se adelantaron a seguir juntos la ventura de amarse. I too have heard this desperately sad tale on the news. After the initial horror of the accident, to think that this beautiful family so full of love should endure even more pain beggars belief. It is something I will never understand and in truth my faith wobbles a great deal right now. The only comfort is that you are all together now running free with no more pain or sadness ever. God bless you all and if ever anyone wondered what love was, see here-this family epitomises love and the unbreakable bond true love brings. I’m sorry this happened to you. Be happy now.Be free. Triste esta Noticia …muy lamentable solo espero q otros padres no tomene esto como ejemplo. la perdida de un hijo es dolorosa pero no es razon para quitarse la vida… Dios siempre da el consuleo q estos padres no estuvieron dispuestos a recibir. No es tan facil, es a personas con menos problemas y sufren de depresion, imaginate lo dificil q es para un ser humano ver morir a alguien tan querido como su hijo amado… no todo el mundo ama a mismo grado y por lo que muestran era grande ese amor, no creo es un ejemplo lo que hicieron al suicidarse, fue definitivamente una reaccion dolorosa, creo que su imagen de dios es distinta a la que puede ser para mi o usted… a lo mejor entendian si se iban por el barranco se iban todos juntos al cielo, yo no se donde esten ahora mismo los padres de Sam, quisa retornando en otra vida para ver si en la proxima hacen las cosas a base de aceptacion y paciencia… mira no se… lo que se es que fue mucho su sufrir y si yo les perdono entiendo que Dios tambien, a lo mejor no tiene nada que ver con perdon sino con aceptacion, cosa que los padres no aceptaron la voluntad de Dios, pero quien dice realmente fue voluntad de Dios y tampoco sabemos si fue falta de voluntad pues se nota eran fuertes, quien sabe si lo sonaron quien sabe tantas cosas… realmente tampoco se, solo se y estoy clara en una sola cosa que el sufrimiento de esos padres fue muy muy muy grande y que nadie humano tiene poder para jusgar mientras si para ayudar en lo que tanto lucharon ellos en ver como personas que no pueden caminar pueden adquirir libertad y a lo mejor eso no depende del movimiento de piernas o brazos sino del movimiento neuronal a otras consiencias / dimensiones donde el cuerpo no importa… bueno repito yo los perdono y solo espero esten ahora mismo juntos, pero eso es solo lo que puedo analizar de lo que mi razon de humano capta, alla en el mas alla, donde el espiritu ve mas son ellos quienes juzgan nosotros aca solo tratamos lo mejor con las experiencias que vivimos y aquellos son dichosos los iluminados por dios en un mundo de materia. Mientras a mi me hace querer estar mas vivo, no se porque, supongo me hace ver las cosas de otra perspectiva y quien sabe si todo esto es un mensaje para aquellos que aun estamos aqui sobre cual realmente es nuestro proposito de vida, no quiero decir es Dios pues muchos dicen esto y terminan suicidandose, creo es mas profundo y complicado que mencionar la palabra Dios o creo que no es complicado nada pero el nisiquiera entender eso ya complica el razonamiento, podria estar aqui horas escribiendo asi que para finalizar dire que amo a estos seres que se fueron y que les perdono deseando logren paz y que otros escuchen un mensaje de amor en esto y no un auspicio al suicidio. Para siempre Dios esté con vos, con sus brazos El os cubra, Su amor, Él os descubra. Para siempre Dios esté con vos, que os guíe su bandera; que la muerte no os hiera, para siempre Dios esté con vos. Su gran sacrificio de amor nos ha encogido el corazón; que en la paz del Señor esté siempre. God Bless all three of you – what pain Neil and Kazumi must have felt…. doesnt bear thinking about. I have no words to express the feeling I have about the smiling boy and his loving and so – oh SO devoted parents. I rarely get moved by things by this sad story nearly brought me into tears. Rest in peace. I know george and the rest of the school miss you terribly, an i for one will miss your smile every morning and evening on the school run. It’s so sad. I never knew about you, until i saw the tragic news. As C. Cox says “shouldnt be recorded as suicide” They loved each other forever. My prayers go to the family. Rest in peace all of you…even i didnt knew you Sam, you and your parents will be missed. You Sam are a bless to the world. You made people from all nations be together, for a cause. You are a lovely lucky boy that have amazing devoted parents like Neil and Kazumi. This is real love. God bless all of you. Rest in peace. Heartbreak and tragedy for such a loving family. God is a vile sadist. CON PROFUNDO DOLOR, NUESTRAS CONDOLENCIAS A FAMILIARES Y AMIGOS. So very sad, but happy that you have all found peace. What devoted parents you had Sam and what a charming little fella you were. The thought of what happened makes my throat sore. Those responsible for the car crash will receive their karma, whereas you and your family shall continue to live a peaceful and blessed life together in the next one. God bless your beautiful souls. what a family. what pain, what suffering, what love, what actions. like a chain reaction, your story has triggered a wave of humanity across the world…where you have showed us that love and love lost are more powerful then anything else on the planet. I am humbled at this story of such an insatiable love. While our bodies have an expiry date, the spirit is immortal. You will continue to live and breathe in all that is good in this world. With a broken heart, I say hello and goodbye. Amen! You put the words just right of my mouth! Sad … very sad news that only q I hope other parents do not take this as an example. the loss of a child is painful but not a sufficient reason to commit suicide … God always gives the comfort that these parents were not willing to receive. I knew you from news, and I have been crying for you since. I watched Sam at youtube, and I was so touched by your beautiful smile and by the strong and devoted love your mom and dad have towards you. May you three rest in peace and eternal happiness. little buddy, rest in peace. now in heaven, give tons of kisses and hugs to your parents. they love you so. i’m clipping 3 branches from my lilac tree and placing them in my sunniest window, in rememberance of your beautiful family. I do rarely have tears running down from my eyes and this is one of this moments. I’m sorry to hear that it has ended this way. You all rest in peace to eternity, one beside another. You’ve gone for so long and it still touches my heart deeply. I remember the message I’ve left that day and how sad I was. One thing relieves the sadness and pain though, Sam, Neil and Kazumi you all are together now, in heaven, to eternity…. Neil and Kazumi, you humble me in your devotion as parents and inspire me to try and be more patient and selfless towards my own children. It is so easy to get bogged down in the vicissitudes and petty annoyances of daily life; your boundless love and dedication to giving your beautiful, exuberant son the very best opportunities in life shows us unequivocally what is truly important. Love is everything. My deepest condolences to your family, friends and partners in Sam’s care. RIP to you all at this horrific time…. I believe sam’s smile and his parents’love will always keep in people’s heart. So much misfortune suffered by one so young, but Sam was very fortunate to have the deep love and unending care that clearly surrounded him for every day of his short life. May the family rest in peace together, united forever. Dear Sam, may God bless you and your mummy & daddy. It comforts me to think that you were so much loved during your short life. God bless you Sam, Neil & Kazumi you will be at peace now as a family……. so sad as a parent of a beautiful daughter i will cherish every second with her. “Walk on brave little soldier with M+D standing guard beside you… RIP all.” I could not say it better myself ~ beautiful boy with kind, loving beautiful parents whose hearts must have been in so much pain… may you all ascend to the peace of heaven free of pain and full of love. What a life full of love Sam must have had, such a beautiful boy with such wonderful parents. May you all rest in peace. Sorry – it is a sad tale. But let’s guard against advocating suicide as a sign of devotion. 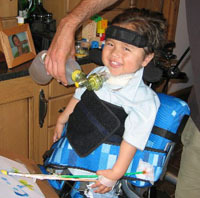 Noone is advocating this, but these people devoted their lives to this little boy and couldn’t see the point in living without him. Any parent losing a child would consider it – he was their reason for living. What a ridiculous thing to say. What sort of moron are you? Keep your stupid and wholly inappropriate comments to yourself. These wonderful people Neil and Kazumi loved their son Sam, real love drives you to make painful decisions. Hi Sam and your amazing parents! I am touched, and yet feel so sad over this story. Your parents are two very amazing people, as Im sure you know. People as good as yourself and your parents are very rare to find and I hope you are finally all at peace together. You will never be forgotton, and the love for you and your parents will live on forever. A wonderul family, a tragic story. May God welcome you all to the kingdom of heaven and unite you in peace evermore. We are priviledged to have known you all, thank you all for enriching our lives. You will never be forgotten, and will always have a special place in our hearts. This couple are example of the finest parents. I hope you are all together now. Rest in peace. May your love for each other never die. Reading these moving and heartfelt tributes to this wonderful but so tragic family has renewed my faith in human nature. There are a lot more beautiful people out there than I imagined in my wildest dreams. Dreadful events like this could be a catalyst for so much good. Think about each other, care about each other and most of all, love each other. God bless Sam and his devoted parents. Hi, Sam, Neil and Kazumi! I hope can hear your laughing from heaven. Hola Sam, espero que estes donde estes seas feliz junto a tus padres que te querian muchisimo, y lo mas importante es que seas libre. Un beso muy grande. Quien soy yo para juzgar algo así, solo puedo respetar su desición y sentir, como lo hago en este momento, una enorme pena por el dolor que ellos, sus padres, deben haber sentido. Su enorme amor y su sacrificio quedarán grabados en alguna parte del Universo y ahí podrán ser felices los tres. Dios sí entiende de un acto de amor absoluto como este … yo simplemente lo respeto. Adiós a los tres. truly a tragic tale, you all deserved so much more from life, i hope in death you are at peace. Even though we never met, there is a sense of loss that i can’t explain. sam with your beautiful smiling face, still smiling despite all your pain. i have cried over this, and am still numb at what happened. Such an imperfect world we live in. My deepest sympathies to all those who knew or were in some way involved with this family. For you beautiful Sam and your devoted parents Neil and Kazumi, may you all rest in peace. We cry for you. Our thoughts are with your family and friends at this time. Allá donde esteis espero que seais felices, como lo fuisteis aquí, hasta que tuviste que marchar. Espero, y se, que estes con tus padres, que lo dieron todo por tí, y que hicieron por reunirse contigo para volver a estar juntos los tres ya por siempre. this story turned me to tears. Sam, you look like a little sweetheart, smiling in every photo despite the obstacles you faced in you extremely short life. your parents are a true inspiration, they’re an example of parenting at its best and love in this cold world. we didn’t get to say. I didn’t want to die. and all I’ve promised you”. there’s no longing for the past. you knew you shouldn’t do. and now at last you’re free. I’m right here, in your heart. A human tragedy that has moved me considerably. One can only wonder how distraught mummy and daddy were at their loss. Rest in peace. Your parents clearly adored you, and obviously tried to make those short 5 years of your life as painless, and easy as possible. I am so sorry to hear about the loss of this family, and my thoughts and prayers go out to their family who must be so sad at this time. Sammie, you were so adorable. I could not help but smile happily looking at your photos. You could surely bring joy to others, lovely! Esta noticia me ha impactado tremendamente, soy padre de un niño especial de 6 años y junto a su madre hemos estado devotamente junto a el desde su nacimiento, no puedo ni imaginarme el enorme dolor que puede acarrear la perdida de Sam para sus padres y por eso la determinacion de acompañarlo en su viaje eterno. Dios los bendiga a los 3 y que en el Reino de los Cielos esten juntos y libres de tanto dolor y sufrimiento. Desde El Salvador una bendicion para todos. My love & sympathy go out to all those close to Sam & his Mummy n Daddy they obviously felt that life didn’t have a purpose without Sam around! It is such a tragic story i just hope that they are all having lots of laughs cuddles and fun together where-ever their souls may be. What love for each other what tragedy for those left behind. May you love together in your new world in peace. They will be so missed and i am honered touched by how they welcomed me into their lives and sam’s and being there. QUE NUESTRO DIOS LOS TENGA EN EL CIELO GOZANDO DE SU GLORIA. Que tristeza mas grande por esta familia, dios los tenga en su gloria disfrutando de sam sin sufrimiento ,en el cielo. May you all rest in peace and be happy together. What incredible love you had for one another. What enormous pain you must have gone through.Hamba gahle. R.I.P.sam,kazumi & neil. My deepest sympathies to the family & friend. I’m so very, very sorry. Your smile has brightened my day today, but your loss cuts deeply. May you and your parents smile together forever, beautiful boy. Looking at the pictures on the site we can all see the love this precious family had for each other. I pray that they are all feeling that love wherever they are now. I hope the family and friends of Neil,Kazumi and Sam will be comforted by knowing their lives were so rich with love. My thoughts and heart goes out to everyone who knew and loved this family. May God bless and keep you Sam, Kazumi and Neil. I pray you are all at peace and safe together. As terrible and drastic their decision seems to be ,is only understandable for them the pain and cruelty of circumstances that life place you in . Neil and Kazumi your dedication to Sam show how love can become more powerful than anything else. At this point in society this remarkable forms of human grieve show us that still out there more love and pain that one could ever imagine … the ones we love are our biggest treasure ,love them today! Others wish they had what we have! … REST IN PEACE ! Such a sad and beautiful story. These really were wonderful people. Hola Sam, cuando lei la noticia de la decision tomada por tus padres me entristecio mucho, pero a la vez me alegró el saber que seguiran los 3 juntos demostrandose el amor que se tuvieron en este mundo, además me hicieron reflexionar y creo que haría lo mismo si le sucediera algo a mi hija. Que Dios los bendiga en el nuevo lugar que se encuentren. Hope You Can All Be At Peace Together Now. Words can not say enough. Such a tragic story! I have 2 young children and the thought of losing them doesn’t make any sense in my head. These poor people must have been going through such pain. Truly devoted parents to such an amazing little boy! You were and still are a shining beacon to all us parents! When we see that bright STAR shine in the night sky we will always think of you and your amazing courage. Sam, look after your mummy & daddy now! Your story has touched my heart, but I’ve fought back the tears as I can tell how brave you and your parents are, instead I will smile for you. I hope you are happily running around like every little boy should be and that there are many tractors there to keep you happy. May you and your lovely mummy and daddy find the peace you deserve. PS I hope too that this site can be kept to show everyone that amongst the at-times cruel world there is love and devotion. So utterly sad to hear this news. My heart breaks. I pray that the family are at peace together. que todo salga bien en donde estes. IN CHILE Today I learned of the news Vandalize ESTOY …. because life is both unfair … PAPA MAMA SON TO REST IN PEACE … FROM CHILE .. IVAN ..
una triste historia, pero lindo amor de padres, mi emocion me embarga al sentir tanto dolor, un abrazo a la distancia a los familiares y amigos de sam…. incluso hasta en su último viaje desidieron acompañarlo..
A una Familia MARAVILLOSA, en su Amor Eterno. Que sus Almas descansen y se sigan amando en un mundo Mejor. Tarde y mala manera de conocerlos, pero el amor demostrado por ellos como familia, supera cualquier juzgamiento del hombre. Un saludo desde aqui en santiago de Chile adonde quieras que esten, pero lo màs bello es que de seguro ya estan todos juntos, si de algo estoy seguro es que DIOS es justo y el tambien perdio un hijo. Dios está feliz de tener como ángeles a personas que han demostrado en la tierra su amor incondicional. Amar a un hijo en las condiciones de Sam, es algo que pocos pueden saber en esta vida. Gloria a Dios por la oportunidad que nos dió a nosotros como familia el tener a mi hermano Marco Aurelio por 34 años de su existencia, sufriendo de su enfermedad, muy parecida al pequeño Sam. Solo mis padres pueden entender el dolor que sienten ustedes con la perdida de un hijo, pero ellos siguieron luchando por nosotros, por mi y mis otros dos hermanos. Pero ustedes solo lo tenían a él y ya que no está en la tierra, debían seguir luchando con él desde donde están ahora. El cielo. Tendrán la alegría que nosotros nunca tendrémos, ver a su hijo sano, verlo correr, jugar, reír y divertirse con los demás ángeles y saber que ahora goza de una vida mejor. Todo el amor del mundo para ustedes, descansen en esa gran paz que ahora disfrutan y sepan que más que juzgarlos, los sentimos realmente complacidos de saber que en el mundo, aún existe el amor. Agradezco conocer su historia porque tambien tengo un pequeño y a veces olvido agradecerle a Dios porque el es sano y muy especial y cuando algo malo pasa es cuando recien valoramos lo que tenemos a nuestro lado, un hijo hermoso, sano y feliz. Ojala algun dia aprendamos del dolor ajeno. Que Dios los tenga en su reino y esten abrazados como siempre debieron estar. When I heard about the death of this family at Beachyhead, I just wanted to cry. They’re at peace now with their son Sam. My heart goes out to their family and friends. Neil and Kazumi were so brave and brokenhearted to have done this. Is sad about this tragical story about SAM and his fathers! Knw they are in God paradise… enjoy ot evergjing with his lovesly boy Sam! jUST PRAYING FOR THEIR SOULS!! QUE INMENSA PENA SENTI CUANDO LEI ESTA LAMENTABLE NOTICIA EN LA PRENSA, YO NO HE TENIDO HIJOS NUNCA, PERO SIENTO EN MI CORAZON EL DOLOR DE AQUELLOS PADRES AL VER PARTIR A SU PEQUEÑO, SIENTO HOY QUE EL AMOR ES EL MAS GRANDE DON QUE DIOS NOS ENTREGA ANTES DE VENIR A ESTE MUNDO Y CREO QUE LA MANERA MAS BELLA DE EXPRESARLO ES EN LA FORMA COMO Neiy y Kazumi EXPRESARON SU AMOR, NO ME CABE DUDA QUE LAS MILES DE ALMAS QUE HEMOS SUFRIDO CON ESTA NOTICIA Y QUE HEMOS EXPRESADO DE UNA U OTRA MANERA NUESTRO SENTIR ANTE ESTA IRREPARABLE PERDIDA, PEDIREMOS A DIOS QUE RECIBA A Neiy,Kazumi Y A SAM CON LOS BRAZOS ABIERTOS, DIOS LES BENDIGA Y LES DE FUERZAS Y CONSUELO PARA SEGUIR Y PIENSEN QUE ELLOS SEGUIRAN EN VUESTROS CORAZONES POR SIEMPRE. Y MUCHAS BENDICIONESY RECUERDEN QUE DIOS LES AMA. Sé que en estos momentos estaréis los tres unidos, corriendo y riendo, porque el amor que os tenías y tenéis seguro que ha traspasado la muerte. Espero que la eterniad os mantenga juntos para siempre. La sonrisa de Sam muestra lo feliz que se sentía por el Amor sublime de los padres,por ello creo que este sacrificio de ellos para estar juntos por toda una eternidad no ha sido en vano, nos lleva a reflexionar a todos en el mundo , que estén por siempre unidos en el Paraíso y que Dios les haya recibido con los brazos abiertos. Que descansen en paz. Dios perdone a estos padres desesperados, por tal fatal determinación, pero en realidad creo que cualquiera que ame tanto a sus hijos a lo mejor tome esta desición , pero tambien es algo de cobardia (sin ofenderse ) porque la vida es hermosa y Dios dá grandes nuevas oportunidades, lo digo porque en mi familia pasamos una situación similar , perder a un ser tan pequeñito, haber realizado una y mil cosas para poder salvarlo y no poderlo lograr es bastante triste, se va con Él una parte de nuestro ser. Pero a lo mejor Dios que es lo mas poderoso les tenía algo mas grande como lo hizo con mi hermano y mi cuñada permitirle tener dos hermosos niños que ahora sin olvidarse en ningún momento del niño que perdieron son felices porque ellos cuentan que son cinco , es decir el angelito que siempre les acompaña y les cuida. Dios tiene predestinada una mejor bendición para cada uno. Mi mas sentido pésame a toda la familia de SAM, NEIL Y KAZUMI y a todos quienes les conocieron y les tuvieron mas cerca porque les dejó un vacio muy grande. DESCANSEN EN LA PAZ DEL SEÑOR. Quito-Ecuador. Quede impactada al leer la noticia de lo acontecido ha esta familia y lo sucedido a Sam..Por el amor de esos Padres,le profesaron asu bello hijo tomaron esa determinacion de estar siempre juntos y no separarse nunca mas.Dios sabe que paso por la mente de esos padres.Hoy estaran camino al reino de Dios y su eternidad ..
Fue impactante y fuerte saber lo que ocurrio , bueno solo queda decir que ojala esten juntos en el cielo que su amor tan fuerte por su hijo siga en el cielo ! ojala que ya esten descansando y que puedan disfrutar de su hijo,que gracias a ustedes uno se da cuenta que si existe el amor de verdad que todavia perdura ! que descansen en paz los tres y que el pequeño sam este con ustedes sus padres que se sacrificaron por el , que su amor pedure por siempre en su viaje que emprendieron a lo eterno ! un beso con cariño y mis mas sentido pesame a la familia de sam y sus padres ! fuerzas ! y que ojala esten descansando en paz y que Dios los tenga en su santo reino ! Awww Sam – What a beautiful smile you have and what a handsome lil fella you are. Hey sweet-cheeks now you can run around in Heaven with the Angels. RIP Sweet Cheeks I may not have known you but I feel a sense of loss. Such a heart breaking story, but the love and devotion this family have for each other is comforting. Rest In Peace Sam, Neil and Kazumi, our thoughts and prayers are with their near and dear ones. Cuando he leido esta noticia se me han caido las lagrimas. No hay peor pesadilla que la muerte de un hijo. Ojala que alli donde esten sean felices. My deepest condolences to the members of Sam,Neil and Kazumis family and friends.The loss of these three beautiful people is tragic and the will be missed greatly by everyone.I did not know them personally but I wish I had the honor of them gracing my life with their presence.My heart breaks as I sit here and cry as I am a mother of 2 children and love them both and would not know what to do if I ever lost either one of my children.Neil and Kazumi you make me wanna be a better parent and from this day forth I will enjoy my children and let the little things go and enjoy them being here with me.May all three of you rest in peace and live happily in heaven they just got three more precious angels. A truly tragic story of how just a split second of loss of concentration and care – behind the wheel,should cause such terrible consequences on a country lane. In their life with Sam his parents asked for prayers, they needed a miracle to make him whole again after such a devastating car crash but they were instead dealt a further blow in the form of a deadly meningitis which wrenched him from them. Finality. They could not go on. Put God out of the equation and science and research into it. Words are cheap the very best condolence people can give is to reach into their pocket and donate to research into spinal injury and make a day come sooner when we can heal the spinal cord after trauma. That would be a real tribute to these special people. Hello Mrs Stockting. I hope you get this Message. We really miss you. All we talk about is you and the year fives want to meet you. Abigail Frostick talks about you all the time and so does practily the whole school! We are all so sorry about what we saw in the paper. we all wish we could see you soon. Best wishes from Me, my 12 cats andeveryone at ST Mary’s school. Awww. Poor kid, Rest In Peace little kid. I’m so sorry about your maum and dad, and you. Don’t worry. Mum And Dad are coming to see you again. Thats how much they love you. In life and in death they have endless love and devotion for you. An example of a deep family bond that will live on. Sam, Neil, Kazumi, you will never be forgotten. Your story has touched me greatly. RIP.